Veteran Joe Swail says having laser eye surgery has made all the difference after his 6-0 win over Joel Walker in the first round of the UK Championship. The Belfast potter, 46, who is ranked 58 in the world, told BBC Sport: "When I was getting up in the morning, I couldn't really see anything. "I have had a lot of bad results and knew something wasn't right. "I got my eyes tested and they found something wrong so I got it corrected. I had to do something drastic." The two-time World Championship semi-finalist, and 2009 Welsh Open runner-up, was in scintillating form at the York Barbican and will face amateur Adam Duffy - a shock winner over Ding Junhui - in round two. Swail added: "I have been really, really well in practice and but it's added pressure to bring it in to the match arena. "I am a firm believer in practising hard and preparing hard and then the door will open. "I got off to a flyer and was in a bit of a zone and it has all come about after getting my eyes done. I got 4-0 up and managed to get the job done done. I am absolutely over the moon. "I had to make a decision. I didn't want to be getting by because I have been putting in the work and not getting the results and I know I am better than that. I had to do something." 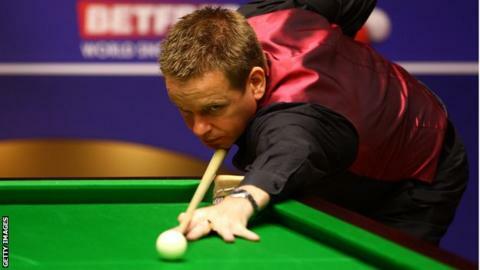 Fellow Northern Irishman Mark Allen was full of praise for his good friend Swail. "It's brilliant," world number 10 Allen told BBC Sport. "I am very close to him and I have known all the troubles he has had off the table. It's great to see him back winning matches in the major tournaments. "We have practised a lot together in the last couple of years and in last month is the best I have seen him play for at least five years. "He absolutely bashed me up in practice and it was great to see because you could see the confidence coming back. "To get a 6-0 win against a very good player like Joel shows where his game is at. He is still a big-time player."